Instant watermelon drink mix, means ready to drink. 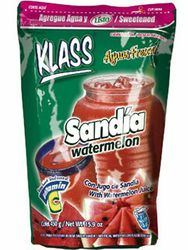 Watermelon is thought to have originated in the Kalahari Desert of Africa. The first recorded watermelon harvest occurred nearly 5,000 years ago in Egypt and is depicted in Egyptian hieroglyphics on the walls of their ancient buildings. Watermelons were often placed in the burial tombs of kings to nourish them in the afterlife. From there, watermelons spread throughout countries along the Mediterranean Sea by way of merchant ships. By the 10th century, watermelon found its way to China, which is now the world's number one producer of watermelons. The 13th century found watermelon spread through the rest of Europe via the Moors. In 1615 the word "watermelon" first appeared in the English dictionary, according to John Mariani in his book, "The Dictionary of American Food & Drink." Southern food historian, John Egerton, believes watermelon made its way to the United States with African slaves as he states in his book, "Southern Food." The United States currently ranks fourth in worldwide production of watermelon. Forty-four states grow watermelons with Florida, Texas, California, Georgia and Arizona consistently leading the country in production.Watermelon has become a year-round staple in households the world over. With more countries than ever importing and exporting watermelons, it is easy to find the sweet, healthy and refreshing fruit any time of the year. We absolutely love this mix but feel a little guilty drinking it because it has both sugar AND aspertame. I'd rather just have the natural sugar.